Tom Cochrun /Light Breezes: Taking for Granted? Blogging brother Mike, keeper of the Genial Misanthrope found in the Rich Blogs list on the right of this page, launched a rumination with his Just A Late Fall Day post. His thoughts on our peaceful and bountiful lives, vis a vis most of the earth's population, punched my guilt button. Assignments put me in some of the most desperate and fearful places in the world. Upon returning home my gratitude for how good we have it pushed that button too. I regret that too many of us take too much for granted. So, motivated by Mike's reflections we will today celebrate some thoughtful, creative and simple but wonderful things. 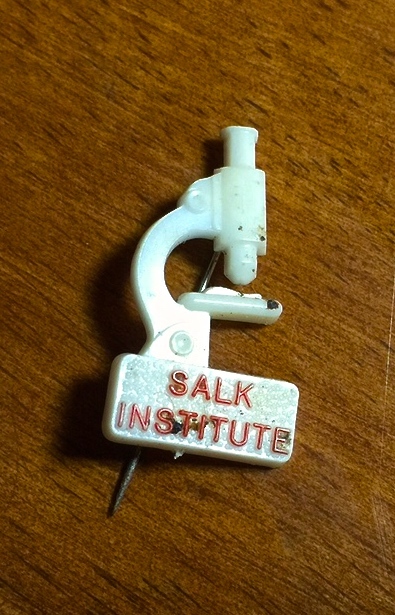 This is the pin I received 62 years ago as a Polio Pioneer. I'm grateful my parents agreed to let me take part in America's largest public health experiment. Polio ravaged communities in the 1950's. In 1954 600 thousand school kids became the first to take the Salk vaccine as human guineau pigs. 443 thousand of us got shots of the experimental vaccine while 210 thousand got a placebo. It worked and soon inoculations were offered to all. Today is World Polio Day. The disease has almost been eradicated though there is more work to do, and remembering is a part of that. I don't recall being terribly frightened about taking the experimental medicine. I was more frightened about the disease which had crippled or killed in our hometown. We also realize the Polio Pioneer public experiment was one of the first society changing events involving boomers. There are places where this election year has been a joy. A couple of weeks ago candidates for our village government, the Community Services District, gathered for an open forum. By the way that really is Ed Asner at the far left. He began the evening by saying he "had a big mouth." He was there to help moderate and to offer his own brand of humor. The forum was civil, intelligent, helpful and was evidence that when approached properly, representative government is as good as it can get, a real conversation among neighbors about a common future. Friends who are nearing completion of a major construction project invited friends to a "bless this building" dinner in the new garage. Shame on me if I ever take hospitality and friendship for granted. Regardless of what it is, seeing a plan come together brings satisfaction. No one can see around the bend. No one lives in constant bliss. Complex problems, changes, the hurt of dear ones, health and so many other matters are real. But there are moments, memories and situations where the best response is to simply be happy and grateful. Mike, thanks for getting this train rolling. That last photo stirred my hunger. Ah yes! Pork loin done superbly on the grill. I remember the polio vaccine...a drop of liquid on a sugar cube, if memory serves. Wonderful pics, as always. And Bruce is right, that pork looks delicious. Appreciation! We had inoculations at Garfield Elementary School, Muncie Indian. The pork was delicious indeed. Mike's love train and your wonderful insights bring to mind and heart, Robert Wicks who says keeping compassion always before our eyes completes God's dynamic circle of grace. Spiritual life finally becomes so real that it has a chance to "positively contaminate" all of life, all of the time. Gratitude is a blessed instinct. It's important to not take anything for granted because life changes so quickly. My Dad's mantra was "Make the most of each day." Now it's mine as well.